The Feast of Saint Richard Wagner – Zero Equals Two! In Saxony, songbird hunting was once a popular sport. The little birds were regarded as a delicacies and were served fried, steamed, or in a soup or stew. By the end of the 19th Century, however, the songbird population had so decreased that the shooting of songbirds was banned. A resourceful baker from Leipzig had the idea to offer small cakes shaped as birds, launching the Leipzig larks into fame. Sift 2 ¾ cups of flour into a bowl. Add half of the butter in small pieces and knead in. Separate the eggs, reserving the whites. Add two egg yolks with the sugar, salt and brandy and knead everything together till you have a firm dough. Wrap the dough in foil and chill for 30 minutes. Meanwhile, drain the apricot jam in a sieve and set aside. Beat the remaining butter in a bowl until light and fluffy, and gradually stir in the powdered sugar, the remaining egg yolks, the nuts and the bitter almond oil. Mix the remaining flour with the cornstarch and stir this in as well. Whisk the egg whites until stiff and fold into the nut mixture. Remove the dough from the refrigerator and place on a floured surface. Roll the dough out thinly. Put 3/4 of the dough into greased ramekins. Press the dough into each ramekin, pulling the edges high up the sides and pierce the bottom six or seven times with a fork. Spread a layer of apricot jam evenly on each, and spread the nut mixture on top of the jam. 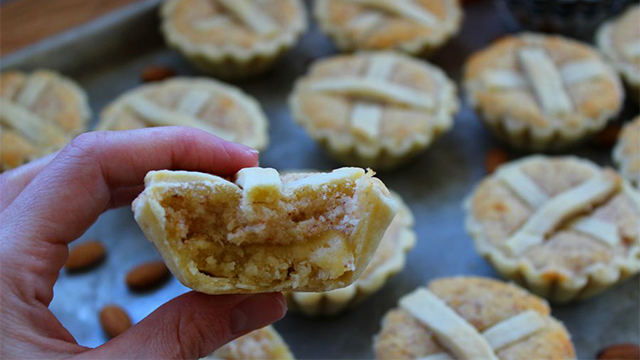 Cut the remaining dough into strips and form into lattices on top. Bake in preheated oven at 350°F/175°C for about 20 min. 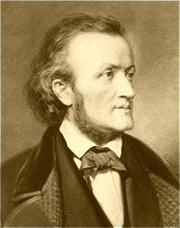 Would you like to learn more about Richard Wagner?